Stylish Star Allu Arjun teamed up with Boyapati Srinu for the movie ‘Sarrainodu’. This film, produced by Allu Aravind under Geetha Arts banner, hits the marquee today. Let’s see if this film lived up to the expectations. Gana (Allu Arjun) always spends time with his uncle (Srikanth), who is a lawyer. His parents want to get him married to Mahalakshmi (Rakul), a village belle. On the way to Mahalakshmi’s village, Gana comes across a young MLA named Hansitha Reddy (Catherine) and flirts with her. One fine day, she accepts his love, but with a condition. What is that condition ? Why Gana locks horns with Vairam Dhanush (Aadhi Pinisetty) ? What are the twists and turns in the plot ? Watch the film for the answers. Allu Arjun does a wonderful job as an actor. His beefed up avatar is a treat for his fans. He excelled in action sequences. He performs very well in the court scene. Aadhi Pinisetty looks stylish and did a fantastic job as a villain. His confrontation scenes with Bunny are very good. Rakul played a performance oriented role and she looks beautiful though it is a deglam role. Catherine also impresses . Brahmanandam, who is being criticized for getting monotonous, evokes laughter. Vidyulleka Raman also played a hilarious role. Sarrainodu has a pretty weak story line and does not have anything good to boast about. After a thumping first half, the proceedings get bogged down towards the last fifteen minutes. As the heavy duty emotions and action sequences are already done by then, the makers are forced to end the film on a predictable note. The characterization of Bunny, his father and Srikanth looks jaded most of the time until the climax. The way Bunny’s character is forced to end up with Rakul Preet by sacrificing Catherine looks a bit unconvincing. The film has too much violence which might not go well with family audience. The makers should have added some more confrontational scenes between Aadi and Bunny to elevate the proceeding even more. Audiences expect high octane action entertainers from Boyapati Srinu every time. But ‘Sarrainodu’ is not up to the mark. The story and screenplay are not interesting and the plot has many loose ends. Director misses many logics. Some scenes in the second half should have been removed. There are many fight sequences. 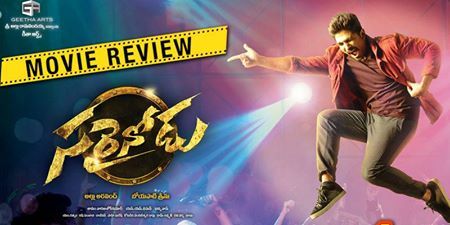 On the whole, ‘Sarrainodu’ may not be received well by the audiences. On the whole, Sarrainodu is indeed a Oora mass entertainer. The film has many elements which will enthrall the fans and general audience big time. Bunny’s stunning transformation, Aadi’s screen presence and amazing action sequences are huge assets. If you are OK with too much violence and manage to bear the last fifteen minutes, you can happily watch Sarrainodu, which will end up as a typical masala entertainer this summer.